Eachine TX1200 is 30x30mm stack mountable, long range VTX. It has 5 bands, 40 total channels (including illegal channels 4, 7 and 8 on the band E, according to the FCC regulations ), 4 power levels 25/200/600/1000mW (actual power output measured below) and PitMode, SmartAudio for controlling the VTX settings remotely via Betaflight OSD, microphone on board for broadcasting audio together with video feed. Eachine TX1200 VTX has MMCX antenna connector which provides more solid and tight joint than small IPEX connector. I've received the Eachine TX806 VTX from Banggood for testing and reviewing. 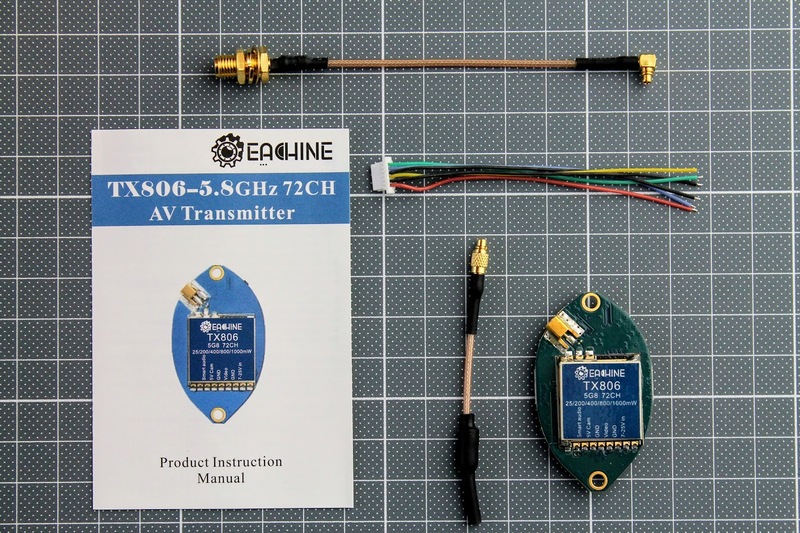 Eachine TX806 (Leaf) VTX has 9 bands A, b, E, F, r, U, o, L, H, 72 total channels (including illegal channels 4, 7 and 8 on the band E, according to the FCC regulations), 5 power levels 25mW/200mW/400mW/800mW/1000mW (actual power output below) and PitMode, SmartAudio for controlling the VTX settings remotely via Betaflight OSD. Eachine TX806 also has microphone on board for brioadcasting audio together with video feed. TX806 can be mounted in the stack as its two holes are aligned exactly to the stacks opposite corners. VTX has MMCX antenna connector which is superiour to small IPEX connector. TX806 comes with a VTX, MMCX linear dipole antenna, MMCX to RP-SMA or SMA adapter pigtail (can be selected on purchase), cable with 6pin 1.0mm JST-SH plug and a small instructions leaflet. I've received this newest Eachine TX805 VTX for a review and here are my impressions, tests and conclusions. 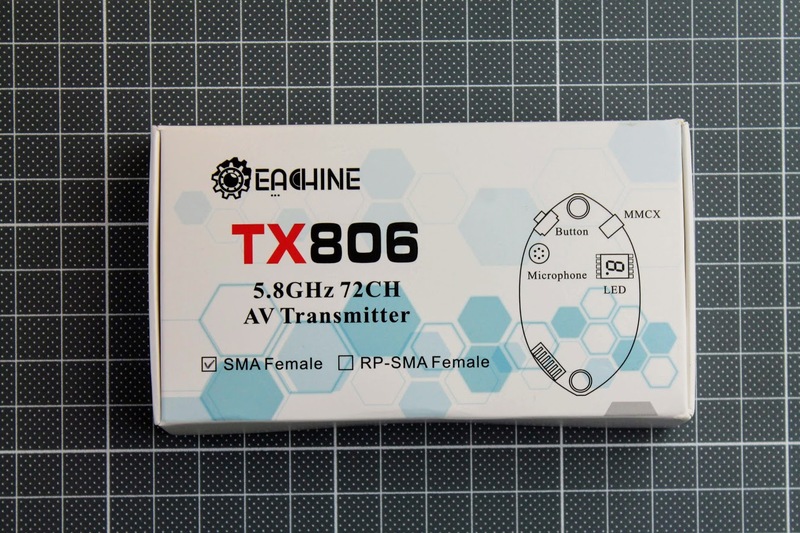 Eachine TX805 has 5 bands A, b, E, F, r, 40 total channels (including illegal channels 4, 7 and 8 on the band E according to FCC regulations), 5 power levels 25-200mw-600mw-800mw (we will test at the actual power output), SmartAudio for controlling the VTX settings remotely via Betaflight OSD. Eachine TX805 even has microphone on board for audio. TX805 can be mounted in the stack as it has two mounting holes with a pattern of 30.5mmx30.5mm. It has MMCX antenna connector which is superiour to small IPEX connector. TX805 comes with a VTX, MMCX linear dipole antenna, MMCX to RP-SMA or SMA adapter pigtail (can be selected on purchase) and a small instructions leaflet. TX805 has 8 LEDs for channel, 5 LEDs for band and 4 LEDs for power output status display instead of the 7 segment LED module. This saves some weight and reduces the height of the VTX. Inside of the box there is only the VTX03S itself and the instructions leaflet. The PCB layout is very similar to the VTX03 with some minor changes. In the August of 2018 Jumper introduced the T8SG Lite radio – the “little brother” of the Jumper T8SG. Lite version of the T8SG comes in a small box, with a chance to be broken in the severe postal processes. I have received the undamaged unit despite my package beeing totally crushed. Inside the box we can find the transmitter itself, USB mini type cable and nice Jumper neck strap (lanyard). FuriBee VR01 goggles were released quite some time ago, but they still can be interesting for the begginers in this RC hobby. Lets take a look at them in more detail. Goggles package contents: The goggles itself, one circular polarized antenna, one patch antenna, power cable, video cable and instructions leaflet. Goggles have three bands head strap, so they mount the head easily. AOKoda has released a series of 1S battery chargers. We have a choice of 3 chargers: CX605 (charge current range: 0.1A-0.5A), CX610 (charge current range: 0.1A-1A) and CX610 HV 4.35V version for charging LiHV batteries (but it can not charge 3.7V lipo batteries). Lets take a look at the CX610 version of the charger. In the box you'll find charger istself, instruction manual, 3 pcs of JST-PH to micro Losi (Molex 2.0mm) and 3 pcs of JST-PH to JST 2.54mm apdapter cables. Charger can be powered from XT60 plug. You can use bigger LiPo batteries in the field. Charger supports 3-6S (9-26V) Lipo input. Alternatively you can power from DC roung 3.5mm jack input with voltage range of 9-26V. On the other side of the charger you'll find micro USB power input (simple mobile phone charger can be used as power source) and USB port for charging output (0.5A-2.4A). Review of the RealAcc BlackBird 205 (also called BlackBird 208 or 210 mm) frame with assembly instructions. Frame kit contents: 4pcs of 4mm arms, arms intersection plate, bottom and top plate, 2pcs of side plate, aluminium standofs, M3 bolts, nylon standofs, action cam holder plates, 4pcs of landing pads, battery holder plate with rubber bumpers, battery strap and basic Matek PDB board. Eachine QX110 V-tail is a brushed quadcopter with V-shape tail leg design. Such frame design in theory should improve the YAW performance. This is theory, but in practice not everything is as expected. This quad has several more interesting features – All in One Flight controller board with RX and OSD, programmable LED tail lights and a buzzer. RX is integrated into the flight controller and can be selected between DSM, Flysky and Frsky types. All in all it looks promising, so let’s start our review. Eachine QX110 came in a box, packed securely. No spare motors were included as stated in the contents list, but comes with a second battery instead. Batteries are 1S 3.7V 600mAh, C rating unspecified, so don’t expect much from these generic ones. Available versions: 8000KV, 10000KV, 12000KV, 15000KV. I have tested the flight duration of Eachine E010 (https://goo.gl/4ppNqN) with standart 4 blade propeller and custom cut to 2 blade propeller. Cutting off 2 blades of standart 4 blade propeller increases efficiency and flight duration up to +25%. You may lose some of the agility but will greatly increase flight times. I have tested Racerstar BR2205S 2300KV motor on the thrust stand. After the first test of stock E010, Chaoli CL-615 and Upgraded Chaoli CL615 motors thrust with the stock 4-balde propeller, I've decided to test the stock propellers, cut down to 2-bladed props. Results were as expected - the max thrust decreased while effectiveness increased. You can clearly see it in the charts. Pull thrust decreased 0.5g in average or 5% and effectiveness increased 0.22g/W in average or about 10%. So cutting down 2 blades out of 4 wil give you a bit less thrust, but better effectiveness thus longer flight times. Also ordered Kados insane, Racerstar 59000RPM motors. Will be making tests with them. Thrust test of Eachine E010 stock motor, Chaoli CL-615 and Chaoli CL-615 Upgraded motors. Stock motors have shown very good results. Chaoli motors showed even less static thrust than stock motors. Chaoli CL-615 Upgraded version motors are really more powerfull, they spin a lot faster (you can even tell it by the sound of spinning proppeler). If you decide to swich to the more powerful motors, I would recommend to upgrade a battery to the 45C 150mAh one (https://goo.gl/ckvqmJ), as Chaoli upgraded motors draws more current (4x1.10A=4.40A) and weaker batteries have a lot of voltage sag. Remember the cheapest 2204 motor on the Banggood - Racerstar Racing Edition 2204 V2 BR2204 2300KV 2-3S Brushless Motor for $5.59? This price will be valid for a few days only. I have recently received a set of Racerstar RF2205 2300Kv motors from Banggood for a review. Motors came well packed in a carton box. Package includes motors, bullet type prop nuts and M3 steel screws. Motors are sold only in packs by 4 (2 CW + 2CCW). It would be great if Racerstar would offer an option to buy single motor. This will enable buying a spare one or a replacement for broken/bent/burnt motor. Personally I would suggest to sell only CW shaft thread version of these motors with a prop lock nuts. Lock nuts hold props hard enough on CW and CCW rotation motors there is no real need of different threads. Benefit of this is versatility of motor use – every motor can be either CW either CCW, no need to have 2 spares and in case of RF2205 - 4 spares. Motors have solid hard steel shaft. That is one of the reasons why they are heavier than BR2205. I would like to share with you my shopping list for this Black Friday. This VTX has 4 power levels: 0 mW – 25 mW – 200mW – 600mW, 5 bands: A – B– C – D – E, 40 channels total. First interesting feature is Transmitting Power OFF on startup. Every time you power this VTX, it starts with TX power OFF (TX led is dim). You have to double click upper button after you power up the VTX to turn video transmission on. Changing of the channels and bands is done with lower button pressing. Short press of the button to change channel, longer press (2sec) for changing band and long press (5sec) for on-board microphone On/Off. Double click of the upper button turns the video transmitting on. Longer press (3sec) changes power level selection 25 – 200 – 600 mW. Cable is 6-pin JST-SH 1.25mm one. Cable has a 3-pin camera connector on another end of the cable, also female servo connector for Power in (7-24V) and female servo connector for PWM input. Camera connector compatible with Eachine 1000TVL CCD camera. This VTX has 4 power levels: 0 mW – 25 mW – 200mW – 600mW, 5 bands: A – b – E – F – r, 40 Channels total. Changing of the settings can be easily done with just one button. Short press of the button to change channel, longer press (2sec) for changing band and long press (5sec) for power level selection. It has RP-SMA antenna plug, despite some misleading information on the user manual leaflet. Cable is 5-pin JST-SH 1.0mm one. The same cable and pinout fits TX5828 transmitter.